The pecan tree was discovered by Cole's son Joseph Cole while planting corn, when he unknowingly plowed over a small pecan tree. The story goes that Joseph Cole, having come home from the Civil War witnessing so much destruction and killing, staked the tree up to protect it, and hand-watered the pecan tree as a testament to life. In 1888, Joseph Cole, sold 294.9 acres to the Philadelphia Place Land Association, with the understanding that the purchaser would continue to protect the tree. The land on which the pecan tree stands was acquired by John S. Armstrong in 1908, for $21 per acre. And because of the story, it became known as the "Million Dollar Monarch. The first lighting of the pecan tree occurred during the Christmas holidays in 1927 by Flippen-Prather Realty. The tree has been adorned with lights every holiday season since, except during World War II and during the 1973 energy crisis. The lighting of the tree is recognized as the oldest community tree lighting tradition in Dallas County. The first lighting of the tree occurred during the Christmas holiday season was by Flippin-Prather Realty in 1927 to promote their new development, Highland Park West. 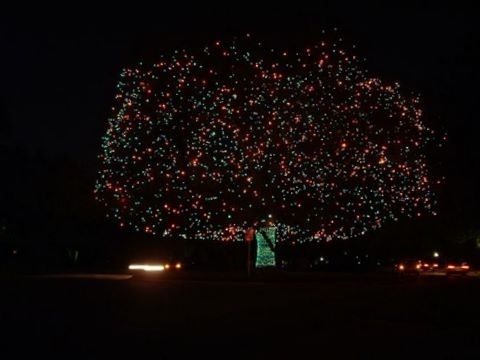 The tree has been adorned with lights every holiday season since, except during World War II. and during the 1973 energy crisis. The lighting of the tree is recognized as the oldest community Christmas tree lighting tradition in Dallas County. The tree requires four men and almost one week to decorate with over 5,000 red, blue, orange, and green Christmas lights.